For their 50th anniversary of their first motorcycle, they introduced the Moto Guzzi V7 III to the world. It is the third generation of the popular bike that has had a complete overhaul. With extreme care and precision, every single detail other than the authenticity and the originality has been fine tuned. Has Moto Guzzi V7 made this edition of the bike even better than before? Let’s find out. Moto Guzzi is known for designing high-quality chassis architecture and was on point when redesigning the third iteration of the V7. The weight distribution is the same as its predecessor, but the front end received reinforcement. Moto Guzzi wanted the bike to satisfy all the needs of the modern biker, that is better stability and handling during cornering. By keeping this in mind, they introduced a new steering geometry that makes it a pleasure to ride the bike. The new pair of high-quality Kayaba shock absorbers is quite responsive in any given biking situation. Moto Guzzi repositioned the foot pegs further forward and lower than the predecessor, making it comfortable for the passenger. The rider position has seen little changes as the seat height is now 770mm and the foot pegs are now aluminium. The new riding position due to the triangulation of the saddle, handlebar, and foot-pegs makes it easy for riders for any size to use the bike. The Moto Guzzi V7 III has a new Traction Control (MGCT) system and ABS. The MGCT system has two sensitivity levels, for dry and slippery roads. Also, the new MGCT system takes tyre wear into consideration, making the traction control system accurate at all times. It also has a new multimedia system called the MG-MP that can connect to any smartphone. It also has a dedicated app on the App Store and the Google Play Store. To view various parameters about the bike, such as rev counter, instant torque and power, average fuel consumption, battery voltage, average speed, and speedometer, all you have to do is connect to the multimedia system via Bluetooth. The Moto Guzzi V7 now has the third iteration of the twin cylinder engine capable of producing 52 bhp at 6,200 rpm and a torque of 60 Nm at 4,900 rpm. The lubrication system in the engine dissipates heat efficiently and reduces absorption of power to favour the reduction of fuel consumption and an increase in performance. It also has a Marelli electronic injection system in the fuel system, which is controlled by the ECU. 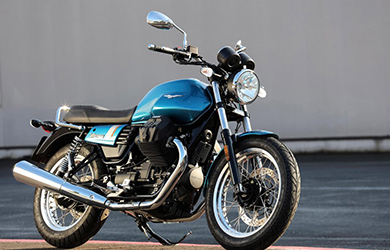 The Moto Guzzi V7 also has a 170mm single disc, dry clutch for reliability and sturdiness while decreasing the load on the handlebar’s lever for a more comfortable ride. The six-speed gearbox is the same as its predecessor but a different ratio for the first and sixth gear. As a result of this, the motorcycle is capable of taking complete advantage of its new power and torque. Overall, the Moto Guzzi V7 III Special is a phenomenal bike, suitable for riders of all sizes. The new changes have made the third iteration of the bike even better. If you want a beautiful bike with a comfortable ride, go for the Moto Guzzi V7 III Special.